Welcome to Air Tech Engineers, Vadodara. Manufacturer & Exporter of Industrial Machines & Spares. The company was founded in the year 1998 at Vadodara. Our market base is spread across Africa, America & other countries. Excellent logistic support, Large production capacity, timeliness, Customization facility & Team of experts are some of the plus points of our organization. 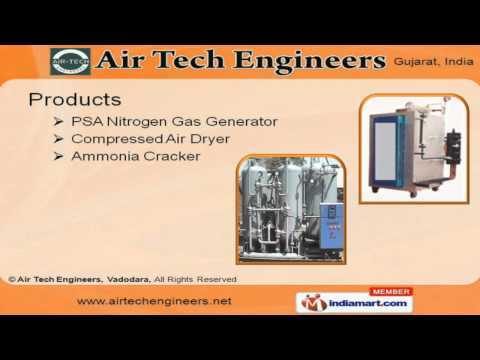 We are leading manufacturer of high quality PSA Nitrogen Gas Generators, Compressed Air Dryers & Ammonia Crackers. Our Activated Carbon Filters, Oxygen Gas Analyzers & Dew Point Meters find application in numerous industries. Along with that we offer Sensors, Control & Automatic Drain Valves that are well known in the market for their durability & performance. We also offer Activated Alumina & Molecular Sieves at industry leading prices. Our Carbon Molecular Sieves & Nickel Catalyst are one of the best in the industry. Along with that we offer Palladium Catalysts, Shell & Tube Type After Coolers.